Thats going to be my next point of call, get the vacuum cleaner part sorted! The filter is filthy, as is the dirt box etc. Will feel more at home doing that bit! No kidding, I am the same way. I'm still not sure what it's more of, robot or vacuum? I used to get the Real robots magazine when I was a kid, but didnt do it much once I started finding alcohol and parties, which is a shame as it was very interesting. Its 50/50 on the 'its a hoover' and 'cool robot' at the moment! Irobot sell roomba devices without the vacuym part for educational purposes, and have released the source code for the newer models to enable them to be hacked about, which I think is great! Well, I think I have Mofset failure! Its been on charge all day, and Ive just come home and turned it on and immediately got the low battery warning. A voltage check showed the same 13v it had at 5am this morning. Ill check on the roomba forum that the ones in my ebay watch list are correct and perform the mofset mod. Apparently its easier to buy bigger modules, and solder extension wires from the motherboard to the modules, and tape the modules ontop of the battery compartment. Battery is on direct charge, I want to see it perform a full cleaning task first before dismantling it long term for a while! Time you bit the bullet & learned to solder buddy, once you've done it a few times it will come easy. You can get practice kits in Maplin for a couple of quid, they even have plain English instructions which is a novelty We bought one for my daughter to start her off & it was OK. I'll look into that, I would like to learn. I do have a basic iron, and some solder, I should practise, probably before playing with the mainboard of the Roomba which looks a bit involved! Yep: Practice on duff boards first. Get yourself a decent solder sucker, some desoldering braid & a small tub of electronics flux as well they make life a whole lot easier. Yet something else I haven't updated in ages, sorry! the battery then died again. So once I have replaced the MOFSETS, I will purchase a new battery. It's currently back in its box for now, I'll look at it next year and try to get some soldering practise in, then I'll pull the main board out and recce out the job to be done, and find some suitable wire. I stripped loads out of my old Ford Puma when I scrapped it years ago, I'll fine an appropriate sized reel of it to use to re-locate the mofsets. Looks like a nice bit of kit, be careful when replacing the MOSFETs they're really static sensitive & need to be handled with care. Thanks for the hint Tech, I'll bear that in mind! Should I lean against a radiator whilst doing it? Wherever you do it, make sure the room doesn't have synthetic carpet. Make sure your soldering iron is earthed, touching a bare heating or water pipe just before doing the job would help dissipate built up static but an anti static wrist band would be better. If you remind me in the New year, I'll send you one. No synthetic carpet sadly, just synthetic wood floor... Can touch a heating pipe with the iron first too. Want to practise on scrap wire first though before committing to buggaring up the main board of Roomba! If I still don't feel confident I won't do it myself, but we shall see. Can't say I've ever bothered with static before, even when building computers on my bedroom carpet! Never lost a component yet, but then you should all realise by now I'm not the last word in best practise! 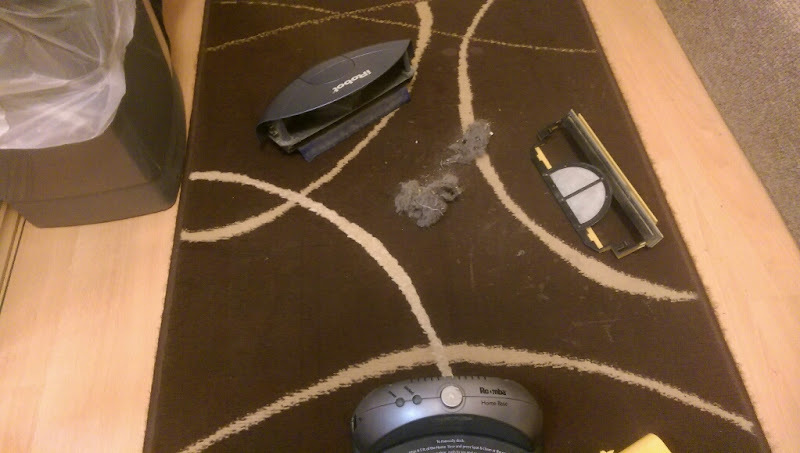 But then I've never played with anything quite as micro-diddly as the roomba electronics before!